This is a complex project that will completely transform the general operation of the neighbourhood and provide it with a new central reference. The project therefore entailed an overall restructuring to accommodate the uses that the new facilities were to be put to, in addition to the layout of the streets and urban roads that were recently opened in the neighbourhood. Urban planning-the first factor influencing project decisions. The new Guinardó Facilities Building is a joint operation of urban planning and architecture, allowing the creation of a new central area in the neighbourhood of Guinardó. Municipal facilities and public Market square are connected to new pedestrian axis of Llívia St., where slope is less steep. The project originates from public space, articulating four different singular areas: the new market Square, the Teodor Llorente’s Park, the Garrotxa St. widening and the interior closed garden. 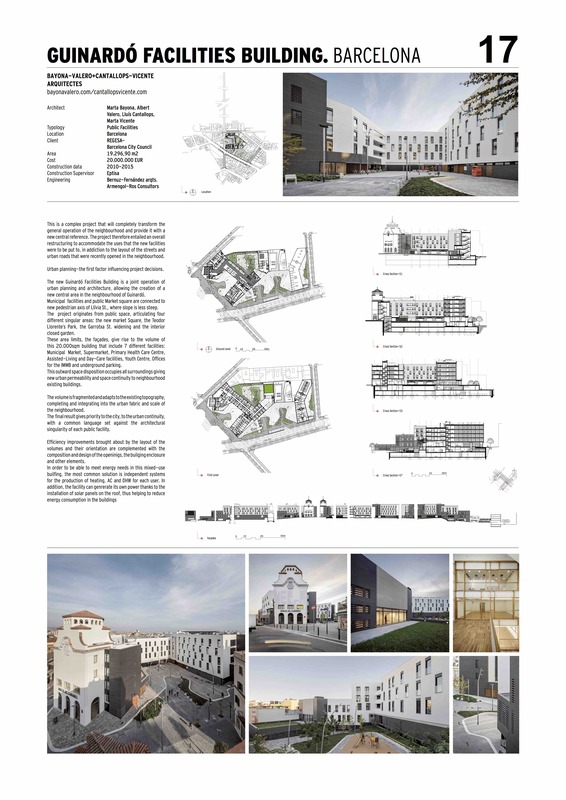 These area limits, the façades, give rise to the volume of this 20.000sqm building that include 7 different facilities: Municipal Market, Supermarket, Primary Health Care Centre,Assisted-Living and Day-Care facilities, Youth Centre, Of cesfor the IMMB and underground parking. This outward space disposition occupies all surroundings giving new urban permeability and space continuity to neighbourhood existing buildings. The volume is fragmented and adapts to the existing topography, completing and integrating into the urban fabric and scale of the neighbourhood. The nal result gives priority to the city, to the urban continuity,with a common language set against the architectural singularity of each public facility. Ef ciency improvements brought about by the layout of thevolumes and their orientation are complemented with the composition and design of the openinigs, the builging enclosure and other elements.